Could your lingerie benefit from a head-turning update? Here's the answer. This edit of Fleur du Mal belts is made in a striking palette that spans monochrome, color-pop and delicate pastel shades. 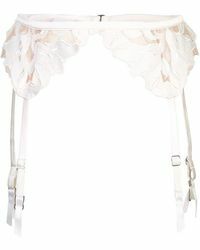 You'll find classic garter belts crafted from soft satin in flattering shapes alongside lace-up corset belts to accentuate your waistline. Whether you're wearing them under clothes, on their own or to cinch the waist of an after-dark dress, these Fleur du Mal belts will bring a seductive element to your look.